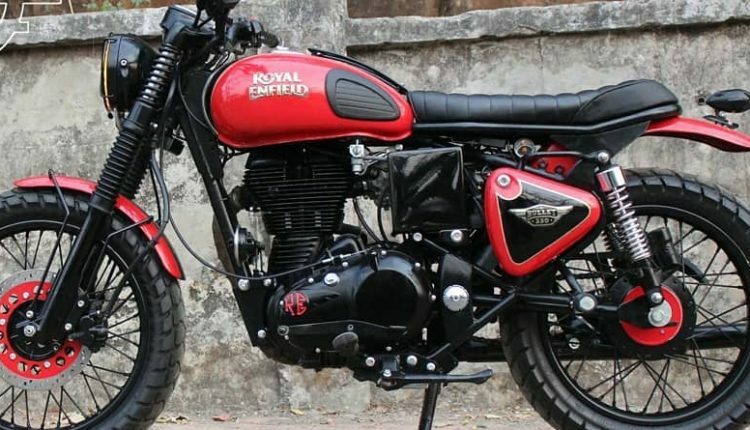 Royal Enfield Encode Scrambler is the most interesting thumper of its kind, carrying a unique front and side profile to capture those minds which are untamable through stock options. 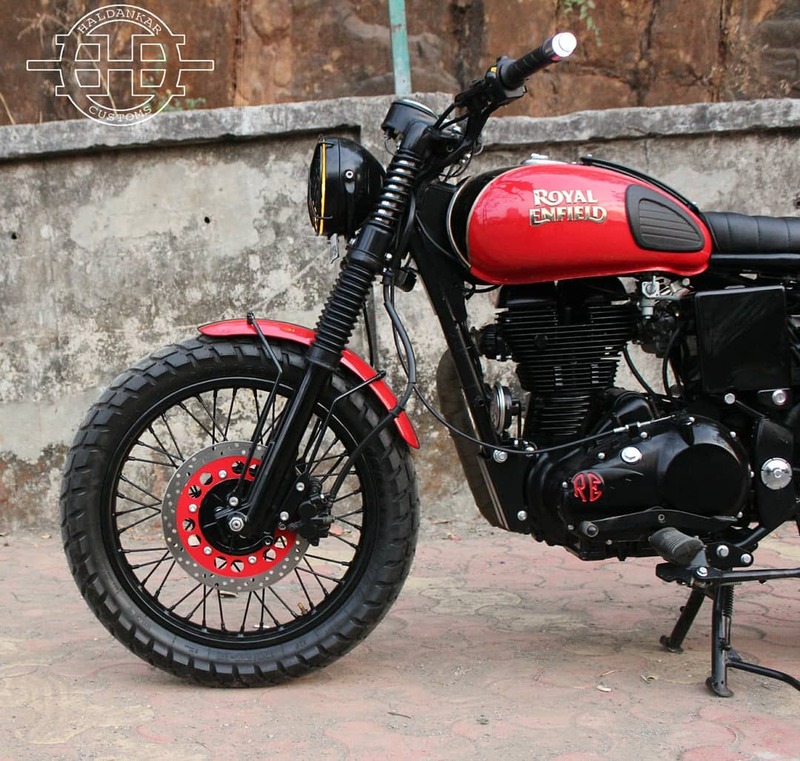 The stock fuel tank now comes with golden Royal Enfield moniker, dual tone paint finish, and luggage carrier. 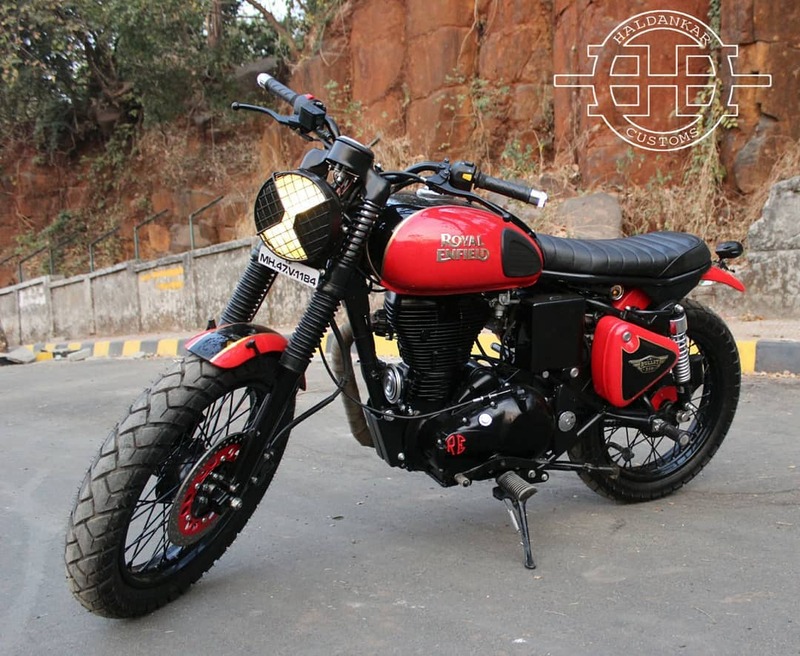 Every component used here has undergone the black treatment, flaunting the perfect contrast with Bright Red body shade and similar inserts in the disc area, engine casing, and rear custom fender. The front half of the pipe is wrapped with a heat insulating wrap while rear comes with a black custom muffler. The front is available with a round headlight, that too without any external casing and unique protector grill. Solid suspension covers make way for the rubber back fork covers on the motorcycle. The rims are completely black, supporting thicker than usual tires with considerable tread for better off-road support. 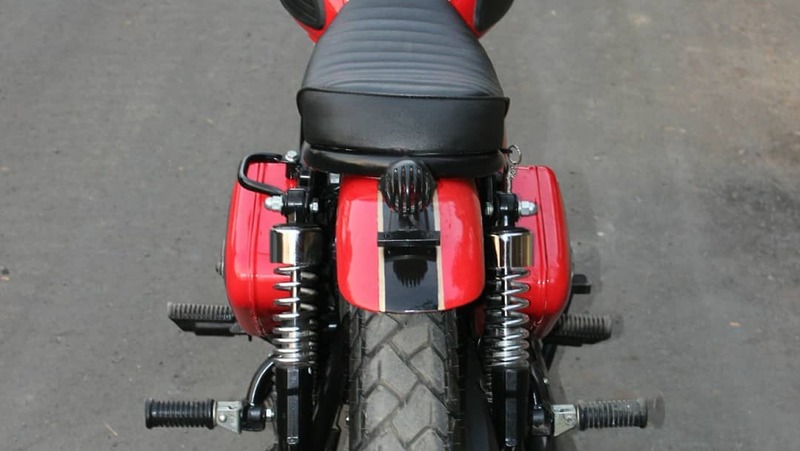 The front and rear fender were chopped to get the typical Scrambler feel, with the rear one even mounted higher than usual for more fun. 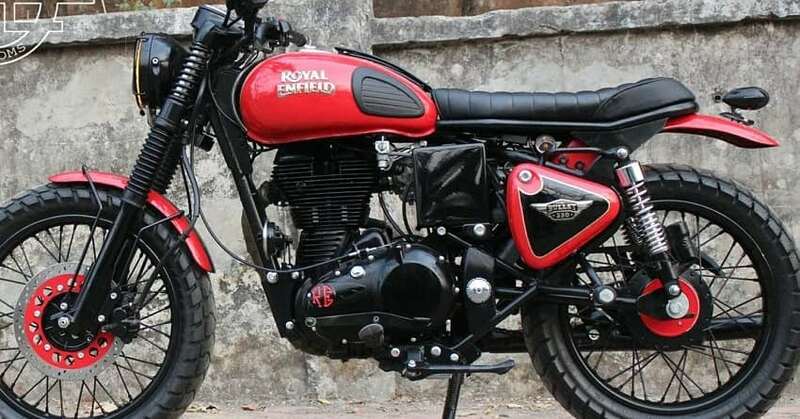 The seat is ribbed and supported by the original Royal Enfield frame. Both sides of the rear suspension were left chrome on the Encode. 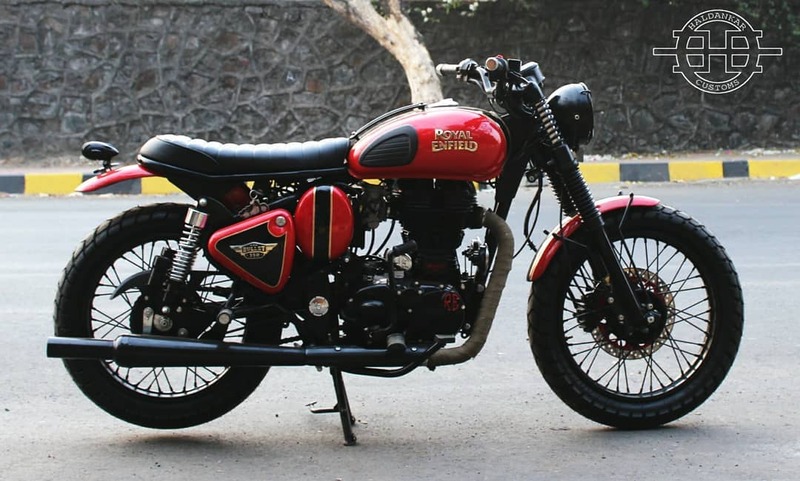 Haldankar Customs made the fact sure that nothing remains usual on this motorcycle, using the same dual tone paint scheme on the side panels and rear fender for the head-turning effect. 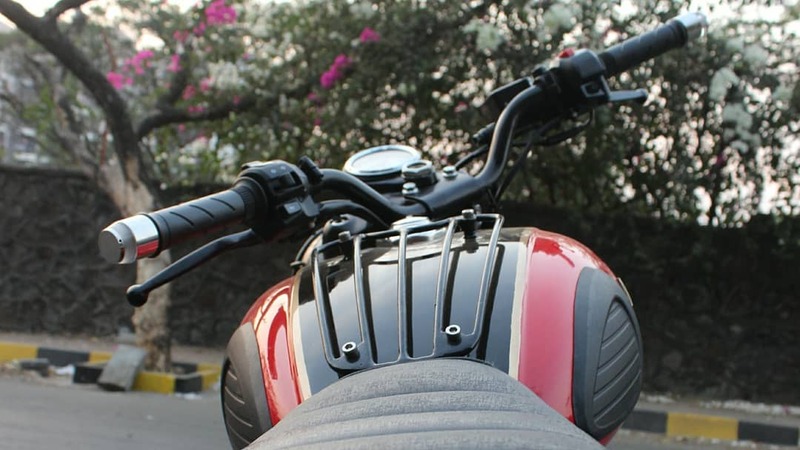 The handlebar is black, further using bar end indicators for a premium feel out of the motorcycle. Encode comes with completely black engine area, single pod instrument console and custom taillight for this unique presentation. 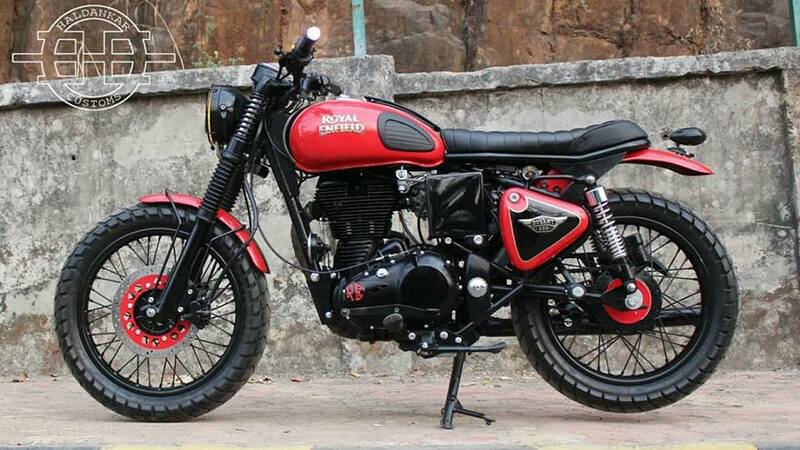 It has been built on Bullet 350, producing 20 hp of maximum power and 28 Nm of torque from the 346cc engine. It comes mated to a 5-speed gearbox. Cost of the modification can be directly discussed with Haldankar Customs through their below given details.